When interior designer Leanne Ford took on an overhaul of a midcentury home in the South Hills of Pittsburgh, she wanted to figure out a way to make it feel of-the-moment — but had some things to figure out. First, the house was in a terrible state. "[It was] dark, dingy, moldy, and outdated," said Ford. "But it was still magic. The clients just knew that it had so much potential." Second, it was an architectural gem. Originally created by esteemed architect Don Owens, an apprentice of Frank Lloyd Wright, the design team exercised an extra measure of caution when updating the historic elements. "The biggest challenge for me as the designer in charge of giving the home a second life was to respect the style and design of the home. We kept the bridge entryway, but made it safer and new," Ford said. "Just because we had to refresh and really start over on most of the home didn't mean we should take all of the interest and uniqueness out." The result? 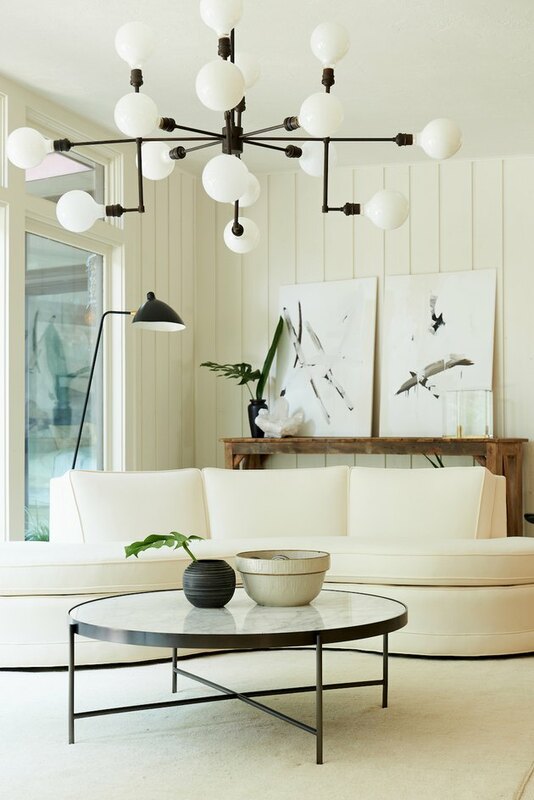 A home where a fresh aesthetic — a monochromatic scheme mixed with natural textures and elements — works within the bones of the space. 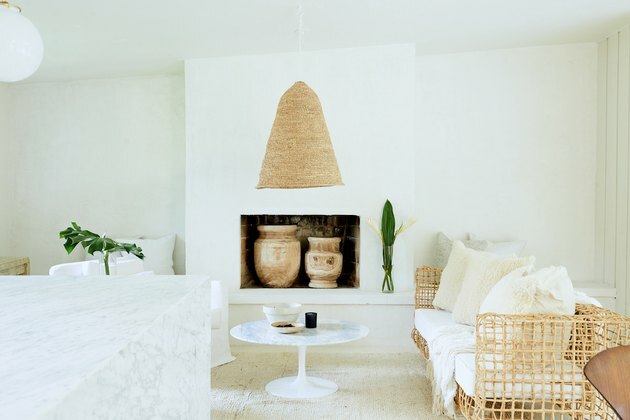 White-on-white was made possible by choosing the perfect paint, Sherwin Williams' Shoji White. A marble table, purchased from Weisshouse, introduces the continuing use of marble throughout the house. A white curved Vladimir Kagan sofa with custom upholstery by Blawnox Upholstery is a heavenly lounge for admiring the lightness in colors and sharp lines in the living room. A boxy recess becomes the perfect place to store and showcase pottery. 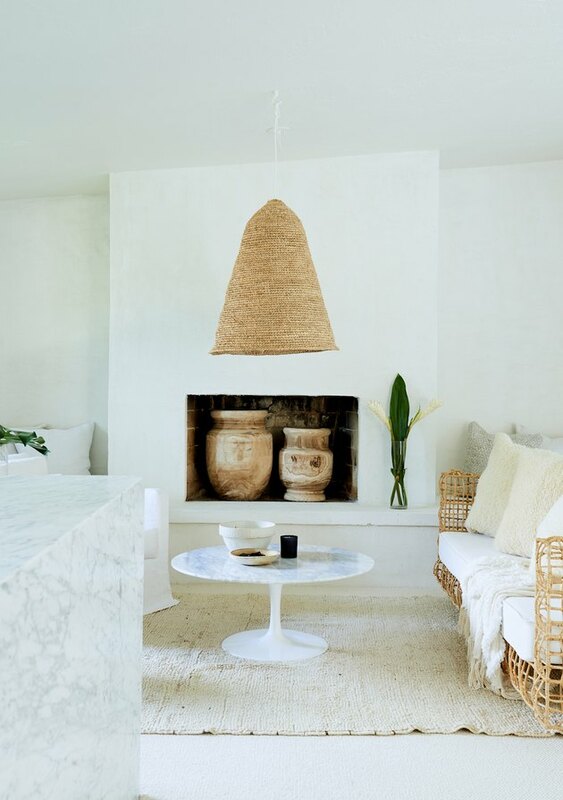 A hanging lamp mirrors the natural tones and airy vibe of the rest of the room. 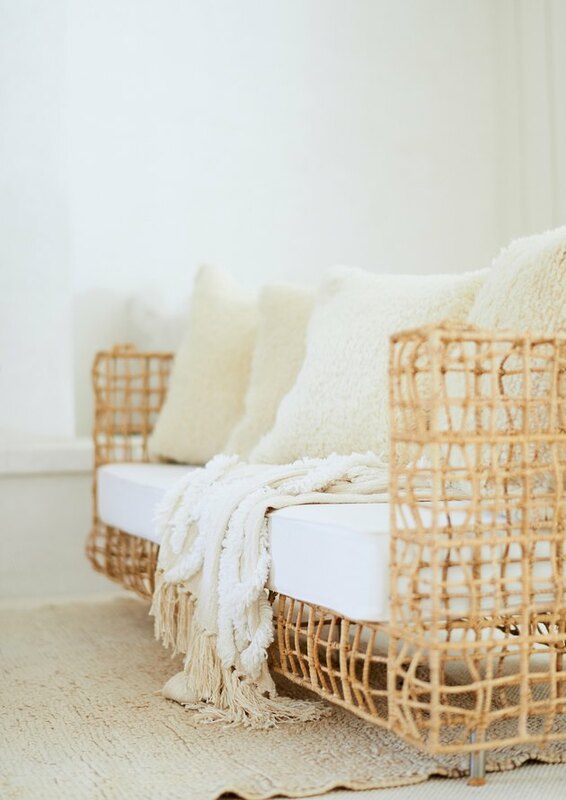 Wicker chairs, purchased from Etsy, outfit the living room. Artwork by Pittsburgh artist Lexi Ribar connects the minimalist and naturalistic decor. 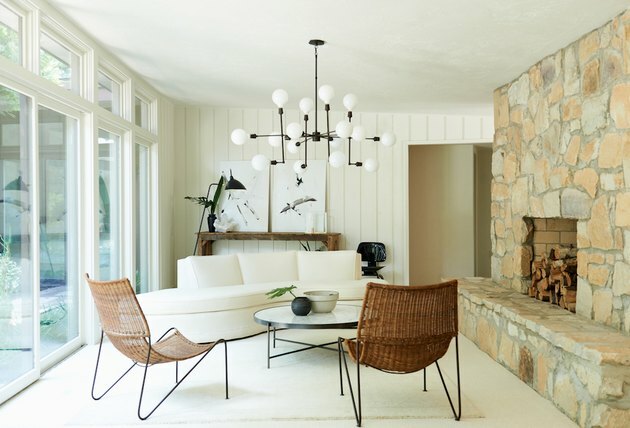 Furnishings made from natural materials, including a wicker Kenneth Cobonpue Yin and Yang sofa, lend an organic appeal. 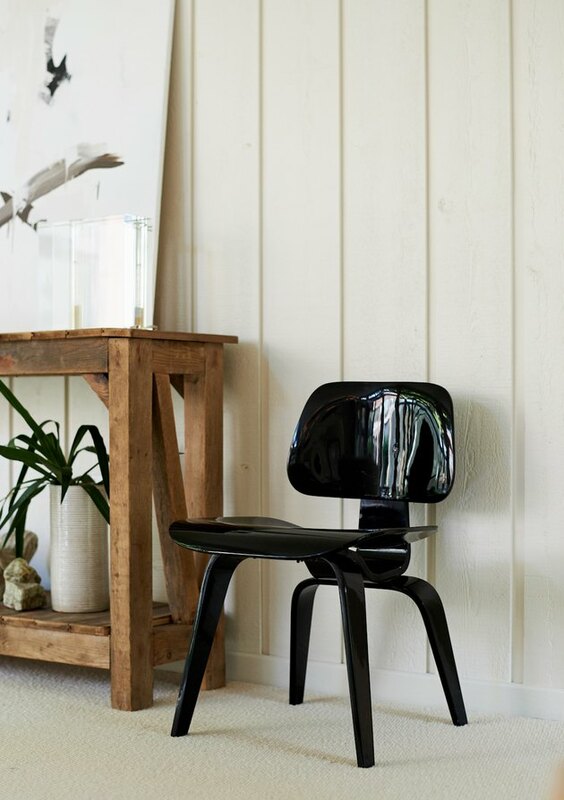 This corner of the living room shows Ford's expertise when it comes to mixing textures and styles — the rustic wood table and ulta-modern, high-gloss chair provide interesting contrast to the space. 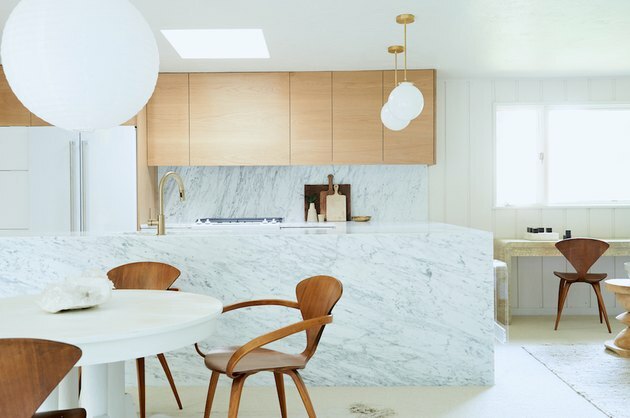 Marble — the dominant feature in the open kitchen and dining room — adds a luxe touch, but doesn't feel ostentatious thanks to the surrounding wood supports. 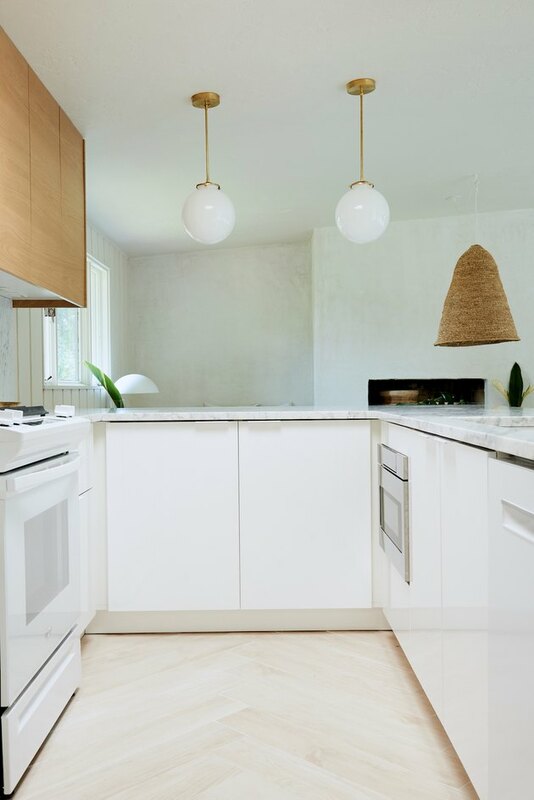 Light hardwood floors make the dining area feel even more open and airy while a paper lantern pendant adds a zen touch. A vintage table, custom painted in a white chalk paint, is a surprising farmhouse addition. 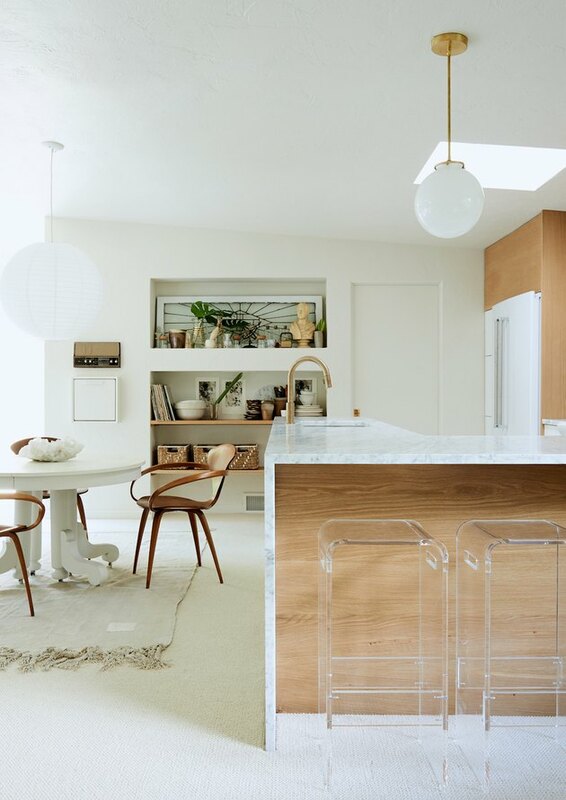 In the kitchen area, modernism is balanced with the organic elements echoed in the living room design. 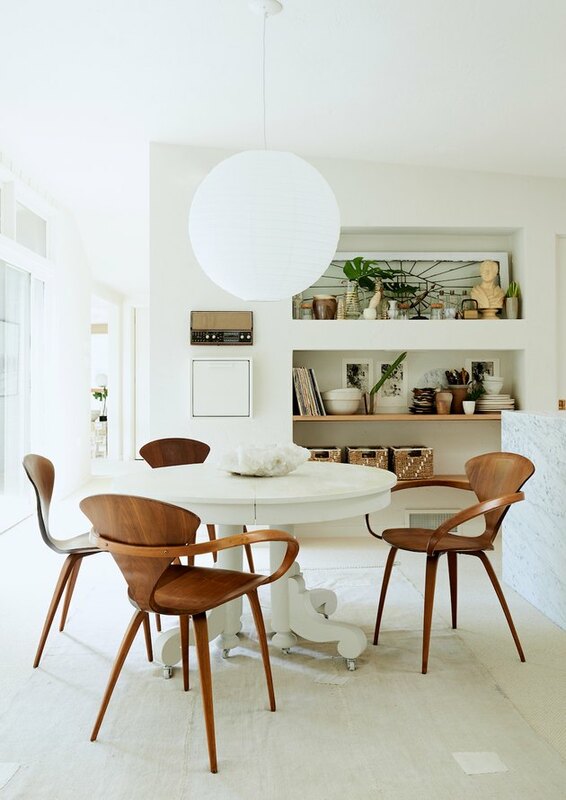 The entire space — decked in a mix of vintage and new — feels clean, natural, and timeless.